Although cute, rabbits can be a real pest in the garden. They can quickly devour all of the plants you are growing. This is a guide about keeping rabbits out of your garden. Tips for keeping bunnies out of gardens from the ThriftyFun community. Go to your local hair salon and ask them for a bag of hair sweepings. Get a large bag full and spread it around the perimeter of your garden. You may have to repeat this after each rain fall but as a hair stylist, I know that we always have plenty to spare at the shops where I have worked. Many folks around my town know that animals do not like the scent of humans and will avoid it at all costs. Also, the hair is biodegradable and will nourish you garden as well. This is free and a easy solution to prevent wild critters from entering your garden. Surround the garden with a chicken wire fence. Bury about 4-5 inches of it into the ground to keep bunnies from digging under it. I was told that bunnies don't like sweet alyssum because of the sweet scent. Where I live, we don't have a rabbit problem. Just scatter the little white seeds among the plants, they re-seed and grow with no problems. Bunnies do not like marigolds. You could plant them around the edge of your garden! I've heard that planting an empty beer or soda bottle wih just enough of the neck exposed for the wind to make it whistle will scare them away. I read that if you purchase a couple of plastic snakes from the dollar store and put them into your garden, it will keep the bunnies from entering the area. I have heard that you can put hot sauce in a spray bottle with some water on the plants and that can ward off their little taste buds. I have also heard to buy plastic snakes and put them in the garden. I haven't personally tried either one. I usually put up a wire bunny proof fence bought at the local hardware store. This year my husband cut the bottoms out of some 5 gal. buckets and placed them over the tomato plants while they were still small. Push them down a tad bit into the dirt. This kept the plants out of reach. Typically, I only seem to have trouble with my tomato plants, not my lettuce, which you think would be the main problem. If you're not thrilled about spreading your hair clippings around, human urine works as well. I try to remember to take a late-evening whiz in the mulch near my Asian Daylillies every now and then. The local rabbit now understands that it's my territory and doesn't munch on them anymore. Wolf urine works too, but it's very inconvenient to chain a wolf in your yard and force him to drink coffee. I haven't tried it. They are cute and fuzzy, and only too eager to share the fruits of your gardening labor. Nothing is more frustrating than watching your hard work literally get nipped off at the bud. Here are some tips for helping you win the war against rabbits. In order to keep them out, first you've got to understand them. The three most common garden rabbits are Jackrabbits, brush rabbits, and cottontails - with cottontails being the most widespread. Rabbits are active both day and night, but feeding usually begins in the early evening hours and continues throughout the night and into the next morning. Most rabbits have a small home range consisting of a few acres, and as long as local resources are plentiful (food and shelter), they are happy to stay put in one area. Females give birth to an average litter of 2-3 "kittens" and can have as many as 5-6 litters per year. The babies are born in shallow nests in the soil (called "forms"), which are covered by leaves, branches, rocks or other debris. The kittens stay in the nests for several weeks, with the mother leaving them hidden during the day so as not to attract the attention of nearby predators. (Note: If you find what appears to be an "abandoned" rabbit nest, it's likely that the mother is hiding close by. She'll come back at night so leave it alone! The mortally rate for baby rabbits is high - even higher for those raised by well-intentioned humans!). Rabbits consume as much as 1-1 1/2 pounds of vegetation each day. If something has been stripping bark from your young trees, nibbling vegetable seedlings, or mowing down your ornamentals, you may have a rabbit problem. Most damage is inflicted close to the ground (lower than 2 feet), except during winter snows, which can elevate rabbits to greater heights. Using their incisors, rabbits make a characteristic diagonal cut that is at a 45 degree angle. 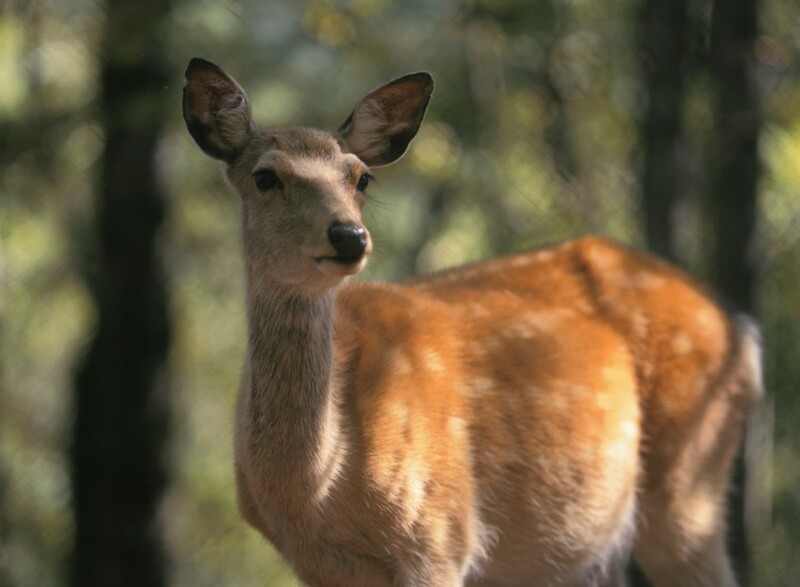 Deer don't have upper front teeth and must twist and pull when browsing. They tend to leave a ragged cut on branches. The rabbits' knife-like teeth leave a clean cut. Fences: This is the best and most effective long-term solution. Erect a fence around garden beds or individual plants. The fence should be at least 48 inches high to prevent rabbits from jumping over. Bury bottom of the fence 4-6 inches into the soil and turn the fence outward to prevent rabbits from digging underneath. If the bottom is not buried, the fence should be staked down around the perimeter to discourage digging. Poultry wire works great for this, just make sure the mesh size is no larger than 1 inch to exclude baby rabbits from entering. If a rabbit should get in it may not get out, so check fenced in areas often. Trunk Guards: Individual plants and small trees, shrubs, and vines can be protected using homemade or commercially bought trunk guards. To make them yourself, simply roll 1 inch mesh into a 18-24 inch cylinder (or larger if needed) and surround the plants. Close the seam using thin gauge wire or zip ties. Make sure to make the cylinders large enough so the rabbits can't browse on leaves through the mesh. Bury them into the ground a few inches or secure them with stakes to keep them securely upright. 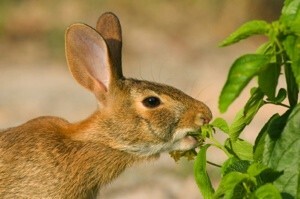 Like all prey animals, rabbit have a keen sense of smell. Some gardeners have reported success with odor repellents (e.g. blood meal, powered fox urine, dog or human hair, cat litter, rotten eggs). Whether homemade or commercial, these products need to be reapplied frequently (especially after it rains) and tend to lose their effectiveness after a period of time. Still, they may work long enough to get young plants to a growth stage where rabbits are no longer interested in them (is there really such a stage?). 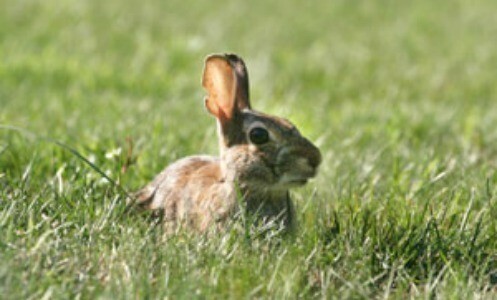 Live trapping of rabbits is only a temporary fix and not recommended for a variety of reasons. Rabbits tend to panic and injure themselves when trapped. Are you prepared to deal with an injured animal? Although rare, rabbits can transmit certain diseases to humans when handled. Trapped animals need to be relocated to somewhere. Laws may vary locally, but many times this requires a written permit to do so. Once trapped rabbits are moved out of the area, those same resources become available and new rabbits move into the area. The cycle simply continues to repeat itself. If you do decide to use live traps, check with your DNR or animal control regarding laws first. Always locate traps in the shade, check it daily, keep pets away, and have a release location planned before you set the trap. *You'll find much larger lists than this is you search various Internet sites. Just remember, rabbits can't read. They are also animals and highly unpredictable. I've personally had rabbits damage several "rabbit proof" plants, including several from the above list. Yes, these plants may be less appealing to rabbits than others, but large local colonies competing for limited amounts of food and rabbits coping with severe winters are not as picky. If you have a cat or dog in the home then you are vacuuming their hair off everything all of the time. Empty your vacuum canister or bag each time around the perimeter of your gardens. Tip: Curb Critters With Container Gardening! If you have a problem with rabbits munching on your flowers, try brushing your cat and then sprinkling the cat hair over the plants. This was the only solution that helped me after I had tried other remedies such as sprinkling cayenne pepper, human hair and blood meal over my plants. Use empty gallon milk jugs for back yard planting season. The rabbits would eat all our new pepper plants. The only way to keep them away was to cut off the bottom and top of the milk jug and bury the wide bottom part in the ground a couple inches. How do we keep the rabbits from eating the bulbs I plant for next year's growth? Try putting hot pepper sauce all over the plants,critters do not like hot stuff,good luck. To protect the bulbs I have planted from the critters in my area I went to the hardware store and bought some chicken wire. I laid it over the flower bed and put some heavy rocks on the wire border. The squirrels, chipmunks and other critters can't chew through the wire to get to the bulbs. Thank you, that is a great idea. All my friends and their parents use this method and not only do they have zero problems, but their plants are bigger and happier, too. First step -find someone with a pet rabbit. Go to rabbit.org for a state by state listing of rescue chapters. They would be happy to hook you up with someone in your city. Second - ask for a ziploc bag of poop. Don't worry, it does not smell. It's dry and crumbly and pellet shaped. Scatter these pellets around or through your veggie patch and voila, no more wild rabbits. Why this works? Rabbits are very territorial and will fight to the death in many cases over land. 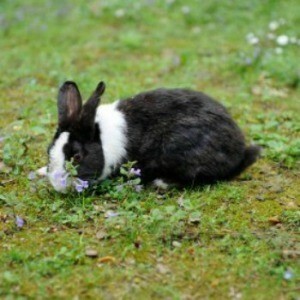 Since domesticated rabbits are much larger than their wild cousins, a wild rabbit will see the poop (or smell it a long ways off) and give your plants a wide berth. The poop tells them a giant rabbit lives there and they will want nothing to do with your plants! Also, rabbit pellets make great fertilizer that will never, ever, burn your crops. It's a win-win situation. I have a House Bunny who's litter box is just like a compost bin. He makes my yard happy and is the best companion I've ever had. Wow, that is awesome info, thank you very much....I love to see the rabbits in our yard, but I do want it to stay pretty with flowers and shrubs and since my little dogs chase them the info on rabbits being territorial is very good to know. This winter the rabbits have eaten the phlox in my garden. I know they will attack my tulips the minute they bloom. Any suggestions to keep them away and send them back to the forest? How do you get rid of rabbits in a garden? I read that you can use crush red pepper sprinkled in your garden. That's fine, but does it harm you plants at all? How do you get rid of bunnies in a garden? Well you could put Irish spring Soap in bar form (keeps some animals out of gardens because of its smell.) Tie it to a stick about 2 ft off the ground and put it around your garden. The stronger the smell the better it keeps them away! A friend plants comfrey. The bunnies would much rather eat it than anything you have in your garden. Question: How Do I Keep Rabbits Out of the Garden? Can someone tell me how to keep rabbits out of my garden safely? Place a rabbit fence around your garden, also if you dust with "Seven" a bug killer, that will also help. Also, try buying children play snakes and place them around. See if that helps. It would keep me out. lol. How do I naturally repel rabbits in a garden? Go to your local feed store, such as an Agway, and purchase fox urine. Spray or drip it out where the rabbits appear. Do store it outside, in a garage or shed, as any drop of it inside will really smell up your home. Mass home improvement stores such as Lowes and Home Depot will also have predator urine located in their garden pesticide section. Of course, if you or a neighbor has dogs, you could always walk them around the perimeter of the garden and let them do their business. Although traditional fences are probably most effective in keeping wildlife out of your garden, there are other methods that can also work well. Commercial and homemade products utilizing certain odors are also effective. This is a guide about using scent fences for repelling deer and rabbits. We're having a lot of trouble with rabbits eating all our plants. Any ideas? Thanks. 1. Fences: This is really the only foolproof method for protecting your garden from rabbits. Fencing should be 4 ft tall and extend at least 6 inches into the ground. Use metal wire with an inch mesh and you will keep them out. 2. Bloodmeal or bonemeal: This gives rabbits the impression hungry predators may be lurking nearby. Sprinkle this on top of the soil or fill cheesecloth bags and hang them from trees and shrubs. 3. Hair: Collect discarded human or pet hair and spread it around the perimeter of susceptible plants. Again, rabbits become leery that hungry predators may be in the vicinity. 4. Mason jars: Some gardeners swear that placing Mason jars in 3 foot intervals around the perimeter of your garden will keep rabbits out. 5. Vinegar and corncobs: Soak corncob halves in vinegar for 24 hours and place them around the garden. Save the leftover vinegar and resoak the corncobs every two weeks to keep rabbits at bay. 6. Powdered fox urine: This stuff may not sound very appealing to work with, but exploiting the rabbit's natural fear of the fox is a good strategy. Find this at your local garden center. 7. Tree guards: These are available in home and garden centers, but are easy to make yourself using foil, or window screen. Wrap the trunks of susceptible trees to a height of at least 2 ft above the deepest level of normal snowfall. 8. Try planting Mexican marigolds or garlic. 9. Rotten eggs: Blend 4 eggs, 4 cloves of garlic, 4 tbsp. of Tabasco with 4 cups of water. Allow this to ferment in the hot sun for a few days and then pour around susceptible plants. You may not be able to stand the smell, but neither will the rabbits. Reapply it rains. Many commercial repellents are available in the form of sprays or powders. These work on the premise that rabbits won't eat something that tastes or smells bad, and usually contain garlic and/or cloves. You will find a wide variety of repellents at home centers and feed stores. Although rabbits will eat anything (and everything) if food sources become scarce, some plants have been found to be less appealing to their pallet. Contact your local extension agency for recommendations on which rabbit-resistant trees, shrubs and plants grow best in your zone.